The multitool pliers by PAHOTECK is a top-quality universal tool with a clever design. 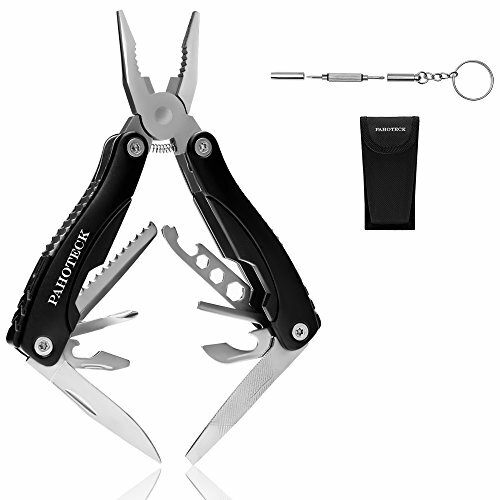 The multifunctional pliers set will help you be prepared for any issue you may face. Put it in the car glove box and use it when needed or hang it onto your belt when in the middle of redecorating or out in the open, in the search of adventures. Including a storage pouch, it's also a great gift to both DIY enthusiasts and hardworking professionals. A VERSATILE MULTIPURPOSE TOOLBOX KIT: The pocket pliers feature multiple utility tools, regular pliers, a reliable wire cutter and stripper, a straight blade knife, a handy bottle opener, a cross-head screwdriver, a file, hook remover and a saw. Is the perfect affordable gift. Store your multifunctional tool in your car as well as at home or at work and enjoy its full functionality at all times. USE IT IN COMPLETE SAFETY: With smooth edges, all the heavy-duty stainless steel tools lock into place, avoiding accidental injuries and having a carry case. The premium pocket knife tool has a safe, foldaway sharp blade, ready to assist you in the outdoors when exploring, camping, fishing, hunting, hiking, DIY projects, military, survival and more. It's easy to take anywhere and use daily. HEAVY-DUTY STAINLESS STEEL FOR LONG LASTING USE: Made of premium materials, the strongly-built, compact, yet lightweight multitool is rustproof and corrosion resistant, able to withstand even rough use and is coming in a lightweight, yet sturdy nylon sheath with a belt loop. Built to last, with an ergonomic design and a non-slip grip, the aluminum and plastic handle provides comfort to the user. TIGHTEN LOOSE SCREWS ON THE GO: With a textured shaft for better grip, the precision mini double-headed screwdriver will help you fix watches, jewelry, computers and electronics. Featuring both a flat head, a Philips screwdriver and a star nut driver, you can clip the convenient, portable repair tool to your keys and it will literally accompany you everywhere. 100% MANUFACTURER MONEY BACK GUARANTEE: If you are not Happy with our product for any reason, please return it to us and you will receive the money back. Pahoteck Guarantees all of it's tools. We want you to feel comfortable, so you can trust in our product. If you have any questions about this product by PAHOTECK, contact us by completing and submitting the form below. If you are looking for a specif part number, please include it with your message.